Click to jump to a topic! I’ve already mentioned that juniors molt out their baby fur. That’s just one of the normal molts that will go on during the life cycle of a Holland Lop. Ideally, your Holland will go into a really big, clean molt once a year and then keep a nice coat for a number of months. It seems that it rarely happens that way, but it could! As your Holland ages, you may find that it takes longer to molt and that the good fur stays for shorter periods of time. I like to see a deep molt on a rabbit whose fur is past its prime. Generally, you will see dark fur around the muzzle and maybe around the eyes that spreads backwards over the head and down the middle of the back. The flanks will be the last to go. During this time, it will be easy to brush away dead fur and perhaps even pluck a few of the last remaining dead hairs to help your bunny get ready for a show. 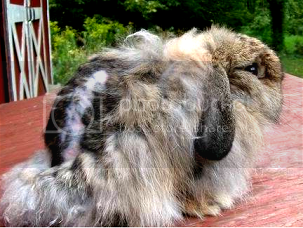 Sometimes, though, you will find your bunny sitting in a white cloud of molting fur. There can be so much fur, in fact, that it looks like a doe has been trying to turn the entire cage into a nest. With this sort of molt, remove the excess fur daily and brush your bunny to remove as much dead fur as possible. This rabbit is NOT sick. Wool breeds like Fuzzy Lops look terrible when shedding. Your rabbit may go through light molts throughout the year. During these light molts, you may be able to brush away the dead hair and continue to show your animal with success. During a heavy molt, it is best to keep your bunny at home. Some bunnies take molting in their stride with little effect. Some may go off their feed or have reduced fertility during molting. Some bunnies may not be able to handle other stresses as they would normally while they are molting. Growing a new fur takes a lot of the bunny’s internal resources. Treat your heavily molting bunny with extra care. You may find that taking a bunny to a show in the middle of a molt will stop it in it’s tracks, only to have it start over again from the beginning, delaying the final clean result you are looking for. I’ve heard a judge say that Holland Lop breeders should never keep their bunnies home due to fur not being in prime condition, given our point distribution. Yes, your bunny may place while molting, but it is not likely to take BOB, let alone BIS, in that condition. And you may delay the optimal result you are looking for. You can help your bunny during a molt by using a soft brush on his coat to remove the dead hairs. Some people, especially breeders of wooled breeds, give their rabbits papaya tablets during a molt. Papaya can break down hair balls. If your bunny is molting heavily, watch for signs of GI Stasis that can be due to fur blockage. All that said, most rabbits molt normally with no concerns and no special care. Next Article: Why your bunny may molt when you didn’t expect it.